We make it our business to service yours. 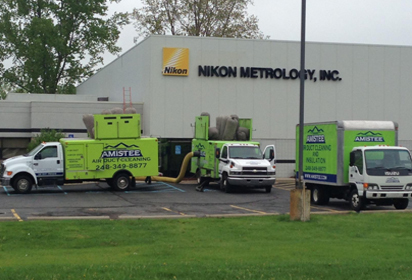 From a small brick and mortar to an expansive industrial park, the Amistee commercial crew represents dedication to exceptional ventilation cleaning in Southeast Michigan. On any given day, you will find our certified technicians crawling through the ductwork of a commercial building to ensure that every square inch has been thoroughly cleaned. Our state-of-the-art equipment includes giant vacuum trucks with up to 17,000 CFM’s of suction power and portable equipment specific to unique jobs such as vacuums for detailed finish work in large ventilation systems. All this equipment is used to improve the air quality of your work environment. State licensed, bonded and insured Amistee Air Duct Cleaning defines what vent cleaning should be. The owners of Amistee Air Duct Cleaners are engineers who apply the latest commercial ventilation system advancements and technology to their own business. Since 2005, Amistee has maintained a reputation of excellence. As members of the NADCA (National Air Duct Cleaner’s Association), we uphold the highest standards in the industry. Inadequate ventilation and the buildup of airborne contaminants produced by outgassing of chemicals, adhesives, machine dust, paint and other finishes can produce eye, nose and throat infections, headaches, fatigue and a host of similar illnesses (also known as Sick Building Syndrome) that may increase employee sick days or lower employee productivity. A proper vent cleaning from Amistee will not only provide your company indoor spaces with healthier air, but you can breathe easier that your staff can continue to work effectively. Unnecessary stress on the HVAC components due to unwanted debris may affect the efficiency of your company’s ventilation system. A “dragging” or resistance to consistent air flow may require an unscheduled system repair. Amistee Air Duct Cleaning has the expertise to evaluate what cleaning and inspection is needed to avoid expensive repairs. Our professional team inspects and cleans roof top units, air handling units, evaporator coils, condensing coils, VAV boxes, multi-zoned systems and more. Bottom line? A ventilation system cleaning from Amistee today can help you avoid big expenses later. Let us plan an air duct cleaning around your hours of operation. Give us a call anytime, 24/7, at (877) 349-8877 for a free estimate. 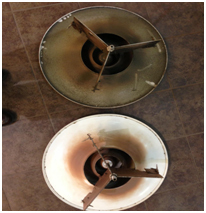 We value your business at Amistee Air Duct Cleaning!